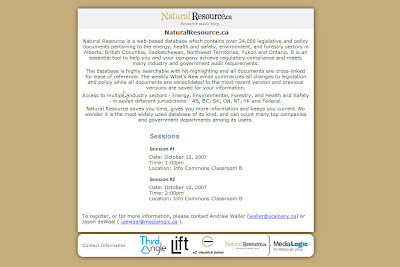 This session will be useful for those interested in accessing legislation and policy on energy, health & safety, environment and forestry in Alberta, BC, Saskatchewan, the Territories and Ontario. It also has some Environmental Assessment reports. Also, the company is in the process of redesigning their site/interface, so this session is also collecting feedback.